The terms fringe earrings and tassel earrings are often used interchangeably but do not necessarily describe the same style of earring. While both are specific styles of dangle earrings (earrings that hang below the earlobe and are able to swing freely with movement), tassel earrings and fringe earrings have a subtle difference. Fringe earrings are typically "dangle" style or hoop style earrings that feature a flat, thick mane of short, blunt-cut fibers, that most often extend in a somewhat stiff linear manner around a semi-circular, or circular base (for a wide, flat profile). Fringe earrings can also feature several individual outcroppings of thick blunt cut fibers that protrude from individual loops on a multi-looped drop or chandelier style earring. Unlike tassel earrings, fringe earrings almost always feature fibers that are blunt-cut short so they are somewhat stiff and do not drape or move freely on their own. Tassels made of soft draping fibers such as silk have a long history adorning everything from robe ties (for religious and intellectual elites) to modern day graduation hats, decorative pillows, and curtains ties. Tassel style earrings are increasingly fashionable and popular and feature either long flowing strands of fiber (such as silk) or gathered lengths of thin delicate chain or tiny strung seed beads that are bound together and hang from a single top knot or cap (used to conceal multiple knots or anchor points). 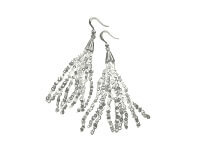 Unlike fringe earrings, tassel earrings are designed to have a long soft drape and swing freely with any movement.